Communication is the way in which we transmit information, knowledge thoughts and ideas from one person to another or to a group of people. In any Practice large or small, communication is vital for the Practice to function effectively. The written word, e.g. letters, emails, diagrams, posters, notice boards etc. The use of telephone systems, including fax machines, answer machines, etc. Communication may be either internal or external. 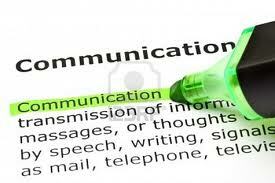 The following are examples of written communication. The name, or initials, of the person taking the message. A memorandum (memo) is an internal written communication which may be used to convey short messages and information to individuals or to all the health care team. Your Surgery will, no doubt, use a memorandum form. Notice boards can be used to convey information to visitors to the Surgery. Notice boards should be positioned so that they are readily visible and accessible to all who are expected to see the notice board. Notice boards should be relevant and kept up to date. Perhaps you could nominate a member of the reception team to keep the notice board up to date. Use the notice board to inform patients of important dates i.e. Flu Clinics, Baby immunisations, Asthma Clinics etc. Having a Practice booklet will let your new patients (and existing patients) know what goes on in your Surgery – opening times, healthcare clinics, and emergency contact numbers – especially how to contact the out of hours. Always make sure your Practice booklet is kept updated. Leaflets can be issued when you have an event in the surgery that is not in your practice booklet. Your Practice should have written protocols to communicate to members of the team. Written protocols contain standards of quality and should be written so that all members of the team involved in the task fully understand the procedures and thus achieve objectives. Protocols are important to a new member of staff. Protocols should be reviewed and updated on a regular basis. Letters remain the most widely used method of written communication. Secretaries should be trained to provide a high standard of letter writing and have some knowledge of medical terminology. Letters are used to communicate with health authorities, PCT’s, Health Boards, medical professionals and patients. For example a GP write referral letters to hospital consultants, hospitals send discharge letters and reports back to GP’s. Computers now provide a networking facility linking hospitals, PCT’s and health authorities, laboratories and medical practices. Understandably by 10.30 on a busy Monday morning it might be “difficult” for a stressed receptionist to make an incoming caller “feel welcome”. Difficult, but not impossible. How does your Surgery work in regards to answering the telephone? Is the telephoned answered at the front desk, along with booking patients in and out? Perhaps you should have a Receptionist answering the telephone away from the desk at the busy periods so they can give the caller their full attention. Secretaries and receptionists receive numerous telephone enquiries during the course of their working day. They may be typing lengthy reports, running a busy surgery or clinic or retrieving data from the computer; but the telephone enquiries and requests continue! Maintaining the balance between conflicting demands is part of the job, and the telephone caller should never be given the impression that you the receptionist is too flustered or annoyed at being interrupted and too busy to deal with their request. Establish the caller’s identity and try to help. Deal with the call as efficiently as you can – if you need time, suggest you call them back – this frees up the phone for another call, and saves asking the caller to hold on. Return to the caller at regular intervals if you are keeping them on hold. If you are unable to help the caller yourself, call on someone who can – if necessary take their details and call them back. In contrast to telephone communication where the only indicators are words and tone of voice, in a face to face encounter there is additional dimension of “non-verbal” communication. These are the signals that are given out and picked up, sometimes subconsciously, but which cause a reaction every bit as strong as to the words and tone. The medical secretary or receptionist also needs to constantly bear in mind the fact that patients are likely not to not feel well, be anxious about what is going to be done to them, what the doctor may say and concerned about the effect of their illness on the family. These feeling make patients stressed and therefore more sensitive to off-hand treatment. From the moment they are dealt with they need to feel that they are the only and only concern of the receptionist.